There are many drop-down controls out there to use in Web pages, but I have not seen any drop-down controls that can show multiple columns like in VB or MS Access. 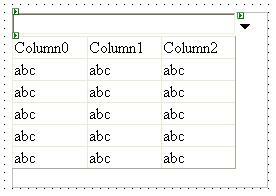 I thought of building my own control that will display the columns based on the selection made in the SQL statement (e.g. Select col1, col2, col3 from db). The control is then populated with the data. It's very simple to use the code. I have shown this sample in VB.NET, but you could use it in C# also (download the dll file). For this control, just add the control to your toolbox by selecting the dll from the location where you unzipped the file. Once you dropped the control in your ASPX page, you could set the properties either through properties window or from the HTML page. Your source code is not ok.So,please give me another asp.net source code like this design. This is very gud article it gives a solution of my problem. No error is coming. But data not disply, if I count the Item after bind they show the number (like 10) is there. But nothing display, Please guide. I used this control with follow the steps. No error is coming. But data not disply, if I count the Item after bind they show the number (like 10) is there. But nothing display, Please guide. the same result with ramesh. follow the steps but not working. debug in ff. and only can see the number 6. please help us. thanks. I have followed all directions as suggested. But could not see expect expected results on page. Can just see rectangle image on screen. and number 6.
if i see page source then everything is there. Today I am trying to use this control using VS2008. Unfortunately I am getting Empty Dropdown. Title: Can i get for code C# and asp.net 2.0? Hi, i am new to web application and i want to use this functionality in my web application...So can i get the code for asp.net 2.0 and visual studio 2005??? I am trying to use your controll, but it is not working, though I followed your each and every steps rightly.Please note that,I am using C# with Asp.Net 2.0 and SqlServer 2000 version. When it runs, it simply shows only textbox and drop down icon in the browser. If possible, please guide me in this regard. Hi I got java script error while click the drop down button.Please help and what to do ?? I tried to use it in vs 2005 and it is not working. I am getting data from database but when i bind it with dropdownlist it does not show any items. when i click it shows error in line 56.
i have doubt that it possible we directly add the text ie value in drop down list in run time. it possible we type text in drop downlist..
i tried your control , its simply good i want little bit extends to this functionality like i want to give search keys on text change , when i enter text in textbox corresponding matched item should focused with color. Title: Does it work with ASP 2.0 and Visual Studio 2005? I cannot get this code to work in visual studio 2005. There they are no longer using data adapters, rather data sources, and it's quite a bit different than 2003. Neither of which I am an expert in yet. Any help you can offer in this area is greatly appreciated. I tried with the multiColDD_List.dll for achiving the functionality of Multi Column Drop Down. My Drop Down need to get bound with the Customer_ID,Customer_Name,Customer_Address. If I am assigning the datatable to the data source of the Combo.The Drop Down is showing all the Column in the datatable.I want to hide the Column Customer_ID. This will Show me the Customer_Name in the Text Box of the Combo.But While saving this data I need the Customer_Id of the selected Customer from the Drop Down. 1.How should I get the Customer_ID of the selected Customer? 2.How to Hide the requird column in the drop down. Is your source code for the control available somewhere? I would like to see how you accomplished the building of the control. Could you please upload similar code in C# ?